For the spice rub, combine the onion powder, lemon pepper, paprika, smoked paprika, sea salt, and ground cumin in a glass jar, close the lid, and shake to blend. Store at room temperature. Prepare a medium-hot fire in your grill. 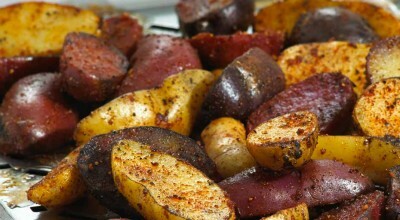 Place the potatoes in a bowl, drizzle with the olive oil, and sprinkle with Spice Rub. Toss to coat. Serving tip: Serve the grilled Fusion Fingerlings on a platter alongside a bowl of Spice Rub Dip. To make Spice Rub Dip, combine ½ cup prepared buttermilk or ranch-style dressing and 1 tsp. Spice Rub in small bowl. Stir to blend. Refrigerate until ready to serve.